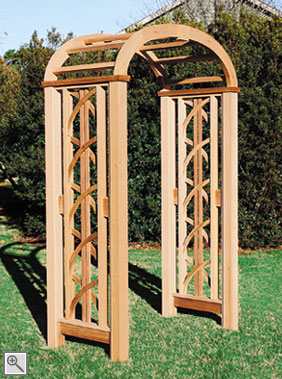 Offering a unique twist to the traditional lattice structure, a vine-like pattern is created in the side panels of this lovely arbor. 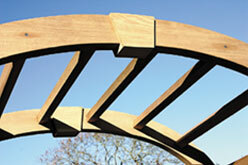 The opposing curved lattice pieces, along with a keystone in the top arch, help establish an Art Deco style. 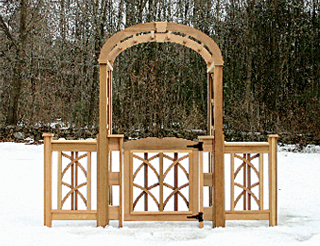 Available with or without the Chesapeake Gate and the Chesapeake Extensions, as shown here, or with any of our other gate and extension styles as referenced in the Arbor Gates and Extensions section. Constructed of clear, kiln dried western red cedar, Cambara mahogany lattice and stainless steel fastenings. 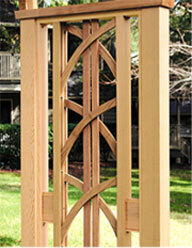 The opening for this arbor may be customized to any size up to a 5' width.